In addition to an abundance of squid, dozens of great white sharks have been sighted recently along California’s coastline. The large number of squid along the coast means more food for predators. On Wednesday, two great whites were caught and released off Manhattan Pier. The day before a man was attacked in Humboldt County across the bay from Eureka. He survived the attack. Francisco Solorio was not as fortunate. Last week, a shark attacked Solorio while he was surfing with friends off of Ocean Beach near Vandenberg Air Force Base. Solorio later died later from his injuries. I thought great whites ate marine mammals. They start out as fish eaters when young and graduate to seals, sea lions and apparently humans now and then. 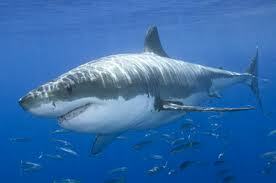 White sharks like that fatty blubber and tasty meat. that’s why they often bite and kill sea otters but never eat them. There’s no fat on a sea otter, just a big ball of dense fur, so they spit them out. Humboldt squid are fierce predators and would probably give a small great white a hellova fight. But I guess a big enough white shark could probably swallow one whole. I seriously doubt two white sharks were caught off a pier. If so, that would have been all over the news. “Humboldt squid are fierce predators”. Great white sharks are not their prey. You want fierce? Try attacking a sea lion, or even a harbor seal. A Humboldt squid would be fantastic, one big calamari steak. And they don’t “swallow one whole” any more than you swallow steaks whole. They tear big things up into bite sized pieces with some serious dentition! Misleading title, nowhere in the original article is it said that the squid attract Great White sharks, in fact there is no evidence anywhere that Great White sharks utilize Humbolt squid as a food source. What IS mentioned is that warmer water off the coast increases the ENTIRE food supply making the area more attractive for squid and sharks. So much misinformation is put out by the lay press. Nope A does not equal B does not equal C The Squid are the predators along with the sharks. Great White sharks do not eat Humbolt squid. They eat seals. Wow, they caught two Great Whites off of a PIER? That’s amazing, if not frickin scary as all get-out! My kids asked what can be done to keep sharks away, and short of shark nets, fishing or removing food sources, not much. Turns out it might just be “food source” that is bringing them in so much. I remember beaches on the east coast had shark nets, but a ton of little jelly fish (what sharks eat out there, apparently). So the nets kept sharks out, but you’d get stung from jellies, as they had free reign inside the netting. Cycle of life, indeed.